Top Colleges, Largely for the Elite By David Leonhardt . Amherst under Marx is, unfortunately, the exception as most elite colleges and Universities fill their student body with the sons and daughters of the wealthy and the upper middle-class. Recent numbers are provided in a March 27, 2011 article in the Chronicle of Higher Education: Elite Colleges Fail to Gain More Students on Pell Grants . The Chronicle found that "just under 15 percent of the undergradu­ates at the country's 50 wealthiest colleges received Pell Grants in 2008-9, the most recent year for which national data are available. That percentage hasn't changed much from 2004-5, around the time that elite institutions focused their attention on the issue. And Pell Grant students are still signifi­cantly less represented at the wealthiest colleges than they are at public and nonprofit four-year colleges nation­wide, where grant recipients accounted for roughly 26 percent of students in 2008-9. Individual colleges among the wealthiest have made gains in enrolling Pell Grant students, who generally come from families with annual incomes of less than $40,000. But others have lost ground." Where does that leave public colleges? Some public Universities are among the elite - University of Michigan, University of Wisconsin, University of Texas at Austin - but most public Universities are decidedly not. Public colleges need to strive to hold down costs and attract a student body that mirrors the economic profile of their state. This is a tall order as the publics face increased pressure from state budget cuts. So called middle skill jobs - those that require some college education or an associate degree - are in the news as policy makers and researchers look at the future of the American economy. These jobs include positions such as network administrators, nurses, physical therapy assistants, computer numerical controlled (CNC) machine operators, emergency medical technicians (EMTs), respiratory therapists. What should be done? We are missing a golden opportunity to encourage additional post-secondary education. Because of high unemployment many young adults have the time to go to college - especially community college. But state and federal government are making it harder for them to attend by withdrawing support for public higher education forcing colleges to raise charges on students. If we are to secure our economic future we should, as a society, invest in that future. That means not scrimping on the college education of our youth. 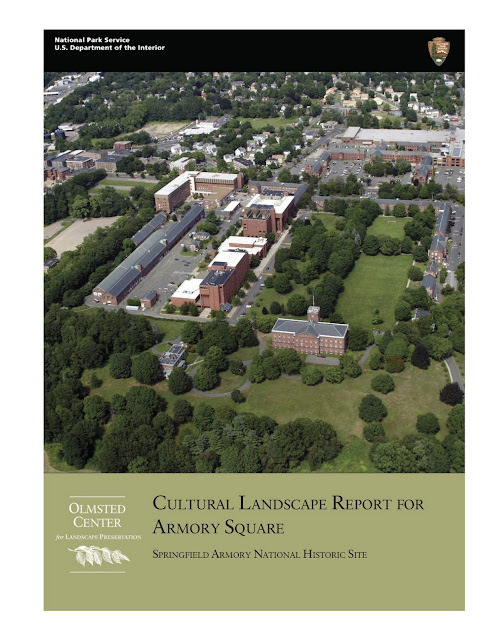 The picture above is the cover of the newly completed cultural landscape report by the National Park Service for the Springfield Armory, the national historic site that is the home of Springfield Technical Community College. The purpose of a cultural landscape report is to record the exterior elements of a site - plantings, terrain, significant markers and monuments, water elements - and to use this document as the basis for managing the site. Because the Armory site has a long history having been established as the first national armory by President George Washington in 1794, the site has gone through many changes which are thoroughly documented by the report. For example, buildings on the site constructed by the US Army date from 1807 to the mid 20th century. During this period the grounds changed with new plantings and landscape changes necessitated by new buildings. However, as the report makes clear, the basic contours of the site remain true to that developed by US Army Lieutenant Colonel Roswell Lee, superintendent of the Armory from 1815 to 1833. 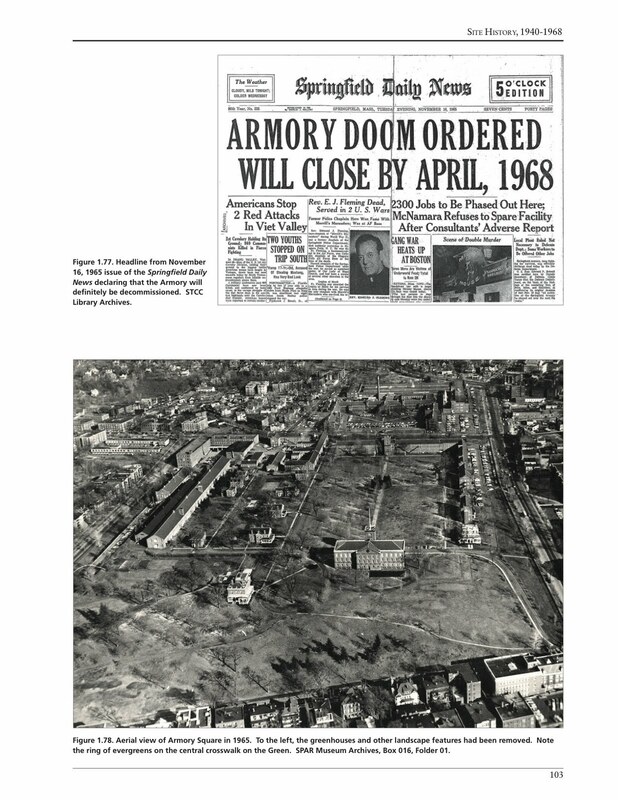 While the closing of the Armory by Secretary of Defense John McNamara in 1968 (see headlines below) created a campus for Springfield Technical Community College, the loss of the Armory produced an economic challenge for the Springfield and surrounding area. The Armory had employed thousands of individuals who did research, development and production of small arms, especially rifles, for the US Army. Moreover, the Armory supported the development of a precision machining industry up and down the Connecticut River Valley that supported companies like Smith and Wesson, Pratt and Whitney and Colt Arms. The closing of the Armory was a great blow to the regional economy, one that is still being felt today. From my own experience, colleges and universities are often late adopters to new ways. That is because these are fundamentally conservative institutions whose job is to transmit the wisdom of previous ages. Additionally, most higher education institutions are non-profits operating outside of the competitive economy. All that is now changing as many higher educational institutions are under tremendous financial pressure from shrinking state and federal budgets and exploding college debt of American students. These institutions now seek ways to control costs while maintaining service to students. Our college has taken a page from the industrial sector by instituting an idea system - called Great Ideas at STCC - designed to mobilize employees to suggest and implement improvements in how work is done. We are using as our mentor University of Massachusetts/Amherst Professor Alan Robinson co-author of the important book Ideas are Free. We are as far as we know the only higher education institution in the United States implementing such a system. Robinson claims and our experience shows that 80% of all the potential savings of time and money are located at the bottom of organization. The genius of a well-designed idea system is that the intelligence and creativity of the majority of employees are listened to and acted upon. The organization improves and with it employee morale. This is, to be sure, a different approach to managing an organization but one with great opportunities.